New Touareg is top of the class | What Car? 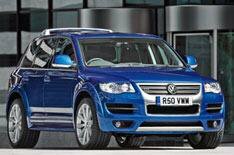 Volkswagen's range-topping Touareg R50 4x4 will cost from 61,885. The R50 is powered by a 343bhp 5.0-litre V10 diesel engine, which has 627lb ft of pulling power. It can travel from 0-62mph in 6.7s with a top speed of 146mph. It manages 22.4mpg and emits 333g/km of carbon dioxide. The R50 is distinguished from the previous range-topper, the Altitude V10 TDI, by having 21-inch alloy wheels, rear roof spoiler, restyled bumpers, wider wheelarches and oval exhaust pipes.